What Is a Recipe for Fettucini Alfredo That Uses Cream Cheese? KraftRecipes.com provides a simple fettuccine Alfredo recipe that uses cream cheese to make the Alfredo sauce. The recipe combines the cream cheese with grated Parmesan cheese, milk, butter and seasonings to create the sauce. It makes enough for four servings. To make this Kraft fettuccine Alfredo recipe, first cook the pasta by bringing a large pot of salted water to boil. Add 1/2 pound of dried fettuccine to the boiling water. Do not break the pasta. Wait for it to soften until it fits in the pot. Stir the pasta well to prevent noodles from sticking to one another. Cook the fettuccine until it is al dente, which is when the pasta is still a little chewy. Drain the pasta immediately once it is cooked. Make the Alfredo sauce by combining, in a saucepan, four ounces of cubed cream cheese, 3/4 cup of milk, 1/4 cup of butter, 1/4 teaspoon of white pepper and 1/8 teaspoon of garlic powder. Warm on low heat, and stir in 1/3 cup grated Parmesan cheese. Mix the sauce until all the ingredients are melted and well blended. Add the sauce to the drained pasta, and toss to coat. Sprinkle approximately 1/8 teaspoon of nutmeg on top. For an meat component, add grilled chicken to the dish. 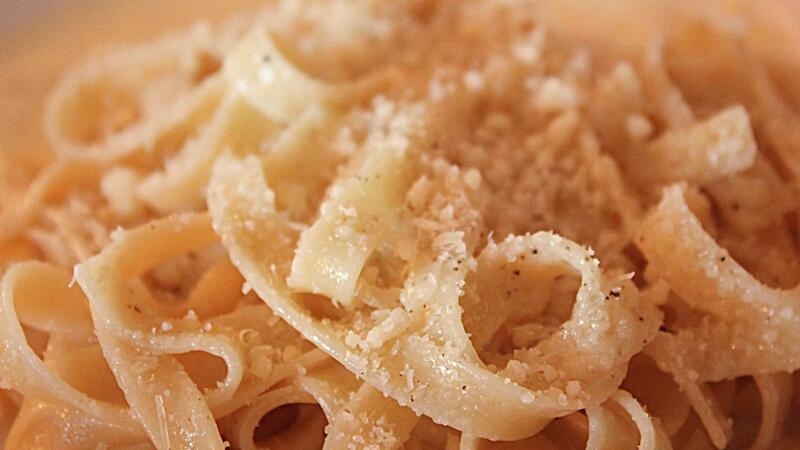 Fettuccine Alfredo serves well with garden salads and Italian bread. How Do You Make Fruit Dip Using Marshmallow Cream and Cream Cheese? What Is a Grape Salad Recipe That Uses Cream Cheese? What Is a Recipe That Uses Kraft Marshmallow Creme?